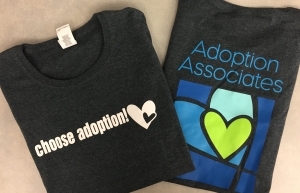 The Choose Adoption! T-shirts were the ‘must-have’s’ when we got them for our volunteers at a recent event, so we decided to order more, and make them available to you in November as part of our National Adoption Awareness Month celebration! We’ve got a basic Tee, a women’s cut Tee, a long-sleeve Tee, and a hooded sweatshirt…. you’re going to want one, or maybe more than one! Prices are $15, $18, and $25. Many have been purchased, but we still have a few available! Call your local office to check on availability, or the main office at 616.667.0677. Family Fun Event and Annual 5k – Mother’s Day weekend!